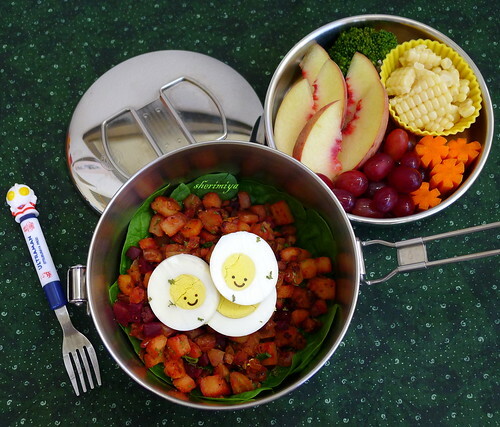 Beet Hash and Egg Bento, a photo by sherimiya ♥ on Flickr. Today I tried something new, since my kids love taters so much: beet hash. It's just diced potatoes and onions, but with diced beets tossed into the mix. I'm telling ya; they couldn't really taste a difference. Or if they did, they didn't care too much. They obviously saw them in there, and I specifically asked MisterMan (since he doesn't care for beets) whether he knew they were beets, and he said "Of course! I know they're beets! But it's okay, I don't mind them when they're mixed in with other stuff." Score! I lay the hash on a bed of spinach and topped with a hard-boiled egg. It's kind of a breakfast-y lunch bento again, isn't it? The top tier of the tiffin holds broccoli, carrots, corn, grapes and white peach. We'll be eating this again for sure. Cute little smiles on the egg makes me so happy! Yum! Beet hash sounds tasty :D and the eggies are so cute! Mmmmm beet hash! I love beets :) I'm glad Mister Man liked it! Me too! I don't know why he doesn't care for them. They taste so mild! I think it might be the texture... when they're crispy (like potatoes) they suddenly get more appealing. Hi Sheri! I love all your creations :) It looks good and tastes good!!! I was wondering how you cook your corn. I usually microwave it and it always end up looking shriveled up(if not eaten right away). Any tips?